Is This A Secret 1500 Year Old Bible? 1500 Year Old Bible Discovered In Turkey, Says Jesus Was not Crucified; Vatican Is Afraid. Most of us have seen this story making its rounds on the internet from time to time. It has been going around for years. It’s about the discovery of a 1500 year old bible. 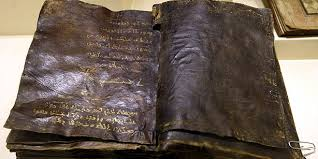 Muslims love this news because this ancient “bible” is said to contain the mysterious Gospel of Barnabas. And the contents of this book supposedly destroys the beliefs of Christians. For example, in this book, Jesus apparently predicts the coming of Muhammad. And it also declares that Judas Iscariot died in place of Jesus. People keep passing this story around but I wonder if anyone has paused to check if this is genuine or not. Isn’t this what any intelligent person would do? In this post, I’m going to give you the opportunity to do just that. Please carefully read the following and then, by all means, please go ahead and check out if what I say is true or false. First of all, this book is NOT the Bible. The Bible is made up of 66 books. Does this ancient “bible” contain 66 books? No. This is just one single book, namely the Gospel of Barnabas, which was not part of canon the Bible. So this discovered book cannot be referred to as a Bible. Secondly, the real Bible is far older than 1500 years. The first book of the Bible, Genesis dates to around 1500 BC. That’s more than 3500 years old! The last book of the Bible, Revelation, itself is more than 2000 years old. Even the oldest manuscript consisting of the entire Bible is over 1700 years old! Anyway, let’s examine this Gospel of Barnabas further and see how reliable it is. Evidence shows that the Gospel of Barnabas is a forgery. No genuine scholar, both Christian and Muslim, accept it as authentic. 1) It is said to be written by Barnabas, one of the original apostles of Jesus. That is not true. None of the apostles was named Barnabas! However, there was later, a co-worker of Paul, named Barnabas. He worked and travelled with Paul, teaching and preaching the same message that Paul taught and preached. So it does not make any sense that this Barnabas would write something that contradicts what he and Paul preached and eventually died for. So, this book was probably written by some someone who mistakenly thought that one of Jesus disciples was Barnabas or impersonated the real Barnabas and used his name to gain credibility. 2) The Gospel of Barnabas states that Muhammad is the Messiah. This is an enormous error by whoever wrote this book. The Bible clearly says that Jesus is the Messiah. The Quran agrees that Jesus is the Messiah. No where did Muhammad ever claim to be the messiah. So Muslims who promote this book instantly have a big problem. If they want to accept the Gospel of Barnabas, they will have to reject the Quran. Both can’t be right. What the Gospel of Barnabas says about Muhammad is in direct contradiction to what the Quran claims. 3) The person who wrote this claims to be a Jew but makes simple mistakes when relating Jewish customs. A real Jew could never commit such mistakes because he is trained from a young child to observe carefully all their language, customs and practices. This, again, points to an impostor. 4) There are also elementary geographical errors. One verse says, that “Jesus sailed to the city of Nazareth.” You cannot sail to the city of Nazareth. The sea is no where near Nazareth! This “Barnabas” also claimed that the town of Capernaum was at the mountains. Capernaum was a seaside town. The nearest mountain was miles away! How could there be such basic errors? This exposes the author as someone who was unfamiliar with the area he was supposed to have lived in. 5) If this book is 1500 years old, this would mean that it is from around 500 A.D. But by 400 A.D. the Bible was already available in many translations and hundreds of copies had been distributed all over the world. No Bible contained this Gospel of Barnabas. Furthermore, there are over 200 ancient Bible manuscripts discovered long before this book was discovered and this false gospel was not canonised at any time. 6) One of the biggest giveaways that this book is not from 500 AD as claimed, is a particular reference to the Year of Jubilee. In the 14th century Pope Boniface VIII decreed that the jubilee is to be celebrated every 100 years. Throughout the Bible, Jubilee is always at 50 year intervals. The only time in history that jubilee was said to be 100 years was around 1300 AD during Pope Boniface’s ‘error’. The next pope, corrected it, changed it back to 50 years. Therefore, it is likely that whoever wrote this gospel wrote it in the 14th century! In the Gospel of Barnabas, the Jubilee was 100 years! At no other time in history was the jubilee 100 years. So this book is not 1500 years old! But rather, it was written probably around 1500 A.D. Around 800 years after Muhammad had died! Why was it written? Clearly, it is an attempt to discredit the Christian faith. Unfortunately, the author, who could have been a Catholic convert to Islam, made too many errors in writing a new “gospel” to undermine his old beliefs and promote his new found faith, as is evident from his numerous errors concerning the beliefs of the Jews, the Christians and even Muslims as well! At no time, has this book been accepted as authentic by Christians and was never a part of the Bible. Even Muslims scholars today agree that it is a fabrication. Dr Zakir Naik says it is useless to refer to a book that is not accepted by Christians. They are right. No Christian accepts it as a genuine gospel. Interestingly but not surprising, there are many things in this gospel that support the Muslim point of view. Muslims who claim that this document is true, must also accept that the Quran is false because this Gospel of Barnabas contradicts the Quran on a number of points.